There are absolutely hundreds of sites where you can download Social Media and other icons for use on websites and blogs. Just as it sounds, a good range of icons in different sizes all in the style of bottle caps. A set of social media icons on leaf backgrounds. A good range of icons all drawn in ink. Very swish! Only Twitter icons, but just so very sophisticated! Love is in the air…a set of 22 icons all in heart shapes, awwww. Pack of 8 social media icons on a globe background. Clean and clear set of 154 icons all in bubbles. Fab set of 28 social media icons on tin cans. I stumbled across an extract of Newsnight’s economics editor Paul Mason’s new book in the g2 section of the Guardian yesterday. A very interesting read. 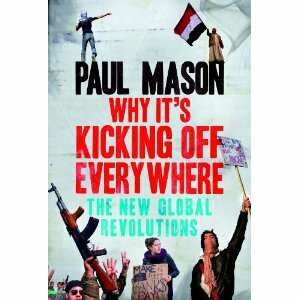 Titled ‘Why It’s Kicking Off Everywhere: The New Global Revolutions,’ Mason examines how technology has been at the heart of the recent global unrest and has been used as a platform for outpourings of discontent. From Occupy protestors in San Francisco, Egyptian anti-government bloggers, to mobile phone footage of the London riots, Mason illustrates how social media and new technology were crucial in shaping the revolutions of 2011, just as they shaped industry, finance and mass culture in the preceding decade. Mason writes: “Here, the crucial concept is the network – whose impact on politics has been a long time coming. The network’s basic law was explained by Bell Telephone boss Theodore Vail as early as 1908: the more people who use the network, the more useful it becomes to each user. The most obvious impact of the “network effect” has been on the media and ideology. Long before people started using Twitter to foment social unrest; mainstream journalists noticed – to their dismay – that the size of one’s public persona or pay cheque carried no guarantee of popularity online. People’s status rises and falls with the reliability and truthfulness of what they contribute. Read Paul Mason’s blog ‘Idle Scrawl’. To get your hands on a copy of ‘Why It’s Kicking Off Everywhere: The New Global Revolutions,’ for less than £10, visit Amazon.